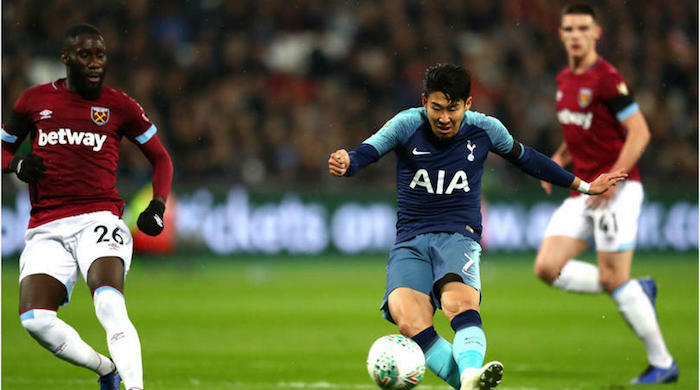 Son Heung-min returned to form in emphatic fashion as his double helped Tottenham to a 3-1 victory at West Ham to send Mauricio Pochettino’s side into the EFL Cup quarter-finals. Son’s goals – his first since March – were Tottenham’s only opportunities of note amid a barrage of West Ham attacks, though, and the hosts’ pressure paid off when Lucas Perez headed in with 19 minutes remaining. However, West Ham’s hopes of a comeback were dashed inside four minutes, Fernando Llorente tucking home from close range to secure progress into the last eight. Manuel Pellegrini’s side were soon punished for their wastefulness, Son pouncing on Arthur Masuaku’s error before coolly rounding Adrian. Perez’s header threatened to make things interesting late on, but West Ham’s defence was exposed again when Llorente reacted quickest to Christian Eriksen’s corner to wrap up the victory.